Michael Young again led the Pitt men’s basketball team with 24 points Wednesday night, but the senior forward offered a simple two-word response for how the Panthers took control of the game against the Omaha Mavericks: Ryan Luther. After scoring a career-high 20 points on perfect 8-of-8 shooting Saturday in the Panthers’ 83-73 win over Rice, Luther took things a step further Wednesday against the Mavericks. Luther carried over his hot streak into Pitt’s matchup against Omaha (7-6), making his first five shots and finishing with 11 points in a 94-75 win at the Petersen Events Center. The 6-foot-9 junior forward made 15 shots in a row over the course of the Panthers’ last three games, setting a new school record for consecutive field goals made. Young led the team with 24 points and 11 rebounds in the win, while senior point guard Jamel Artis contributed 19 points. 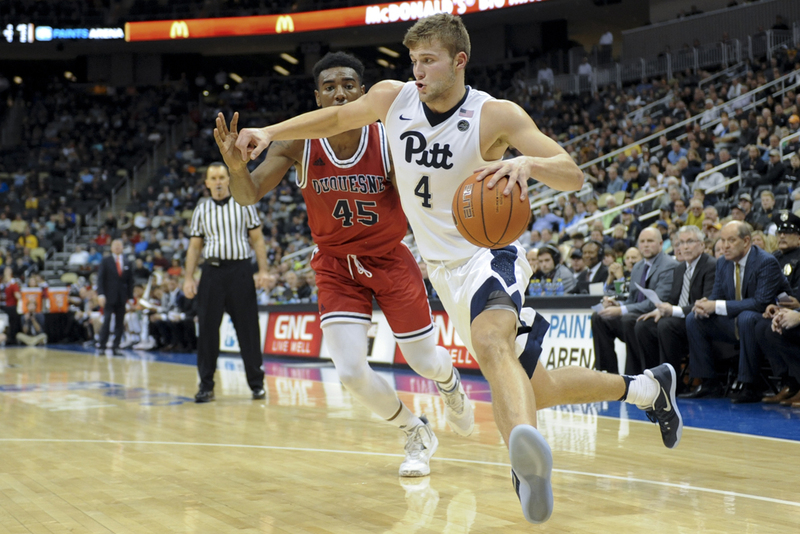 The final score might indicate that Pitt dispatched of its opponent with little resistance, but this was anything but a dominant performance. Throughout the first half, it looked like the Panthers were locked into another closely contested battle against another unheralded opponent. Omaha’s quickness in the backcourt gave the Panthers fits early on. The Mavericks’ undersized but feisty guards forced six Pitt turnovers in the first eight minutes, turning the steals into easy fastbreak points. Guard JT Gibson got the Mavericks on the board first by drilling a 3-pointer while getting fouled. Gibson converted the free throw to complete the 4-point play. After a free throw by Pitt senior forward Sheldon Jeter, Artis hit a three of his own to tie the game. Sophomore forward Cameron Johnson hit a three to give the Panthers a 9-6 lead, but Omaha took it right back with a pair of jumpers by forward Tre’Shawn Thurman and guard Tra-Deon Hollins. Young tied the game at 14 with a three, but Thurman and Hollins responded with consecutive layups to make it a four-point Mavericks lead. With the Panthers starting to lose control of the game, Artis decided to take over. The 6-foot-7 senior hit a pair of free throws followed by a layup and a long jumper in transition to reclaim the lead for Pitt. Omaha regained the lead, but Young took it right back with a driving layup for the Panthers. Luther flew into the lane on Pitt’s next possession for an authoritative one-handed slam, and Artis followed with another 3-pointer to give the Panthers a 27-21 lead. Just when it seemed Pitt might have things under control, Omaha’s relentless defense brought the Mavericks right back into the game. A pair of 3-pointers by guard Marcus Tyus tied the game at 27, then a steal and fastbreak layup by Tyus gave Omaha a two-point lead. Another layup by Thurman made it a 31-28 Mavericks lead with 3:50 remaining in the half, and fans inside the Pete began voicing their frustrations. The Panthers must have heard them, because they responded with an inspired performance from some unsung players. With Young and Artis getting some rest, Luther nailed a 3-pointer to tie the game and added a layup to give Pitt a two-point lead. Then, after a pair of buckets by Johnson and senior guard Chris Jones extended the Panthers’ lead, true freshman point guard Justice Kithcart came off the bench and turned a steal into a fastbreak layup to make it a 10-point Pitt lead. The Panthers remained hot with their two leading scorers cooling off on the bench, putting together a 15-0 run to take a 43-31 lead. Thurman ended Pitt’s run with a dunk late in the half, but Young came back in the game and buried a three just before the buzzer to make it 46-33 at the break. Luther then scored on back-to-back layups early in the second half, the second of which was his 15th made field goal in a row. The record-setting bucket also gave the Panthers a 55-41 lead, an advantage they continued to stretch throughout the second half. Pitt took much better care of the ball after committing 10 turnovers in the first half, giving the ball up only four times in the final 20 minutes. The Panthers continued to build their lead, and Stallings was able to pull his starters with four minutes to play and the team holding a comfortable 20-point advantage. The Panthers cruised the rest of the way to a 94-75 victory, moving to 10-2 on the season with one more non-conference game to play. Pitt will host the Marshall Thundering Herd at the Pete at 7 p.m. Wednesday, Dec. 28.